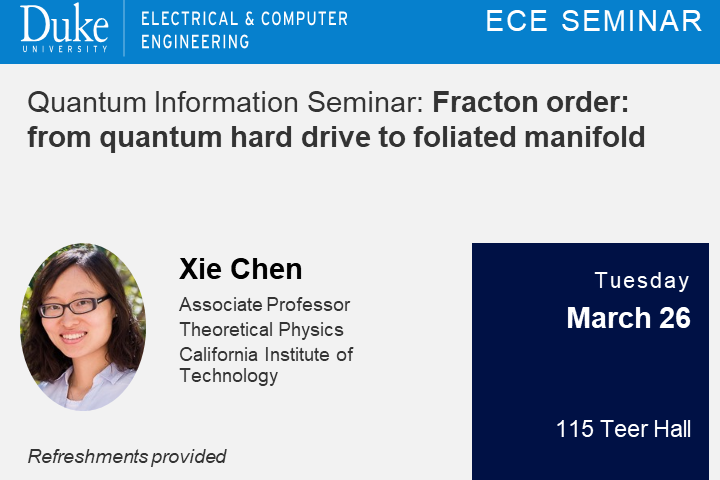 ABSTRACT: One major open problem in quantum information theory is how to build a quantum hard drive, i.e. a quantum mechanical system that can store quantum information reliably for a very long time without active error correction. No completely satisfying solution to this problem has been found, but in the search for possibilities a whole new class of quantum many-body models have been discovered with exotic properties that have never been seen before. This new class of models, dubbed the "fracton" models, host point excitations that cannot move freely, have robust ground state degeneracy that increases with system size, and have unusually slow thermalization dynamics even in the absence of any disorder. In this talk, I will introduce some of the most important fracton models and present a systematic framework for characterizing their universal properties. By realizing that the model properties depend on the foliation structure of the underlying manifold, we are able to reveal the hidden equivalence relation between many seemingly different models and identify the direction of search for new nontrivial features. BIO: Xie Chen is an Associate Professor of Theoretical Physics at the California Institute of Technology. Dr. Chen obtained her Ph.D. degree from MIT in 2012 and was a Miller research fellow at UC Berkeley for two years before joining Caltech in 2014. Dr. Chen was the recipient of NSF Faculty Early Career Award and the Sloan Research Fellowship Award.